Smash It Demolition Derby and New Jasper Fire Department officials react as Xenia’s Tony Jenkins climbs out of his burning car, July 30 during the Street Mini division competition at the Greene County Fair. Jenkins was unharmed in the incident and finished third. Xenia’s Matthew Reed won the 25-car event. 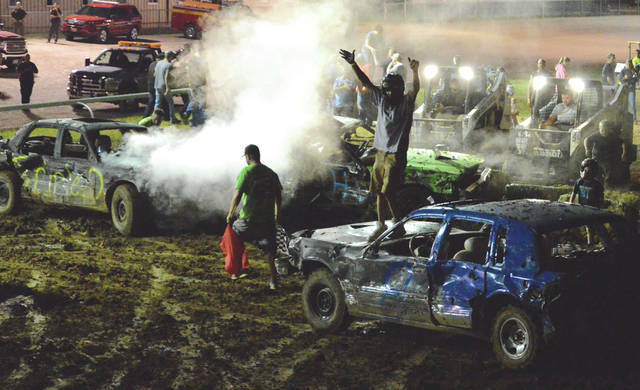 George Stevens of Xenia celebrates atop his battered machine after winning the Smash It Demolition Derby Full-size Street event, July 30 at the Greene County Fair. 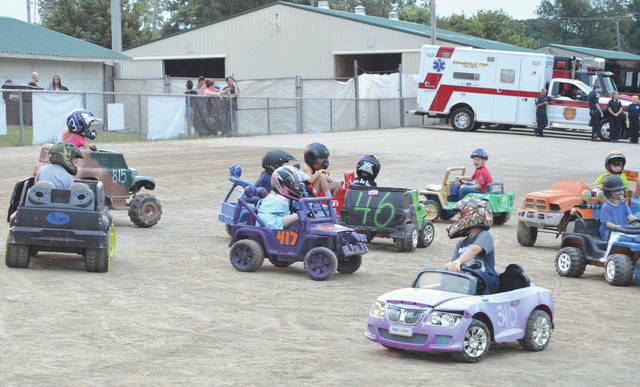 Seventeen future Demolition Derby drivers got into the act during the Power Wheels Kiddie Car event, which started off the July 30 Smash It Demolition Derby at the Greene County Fair. 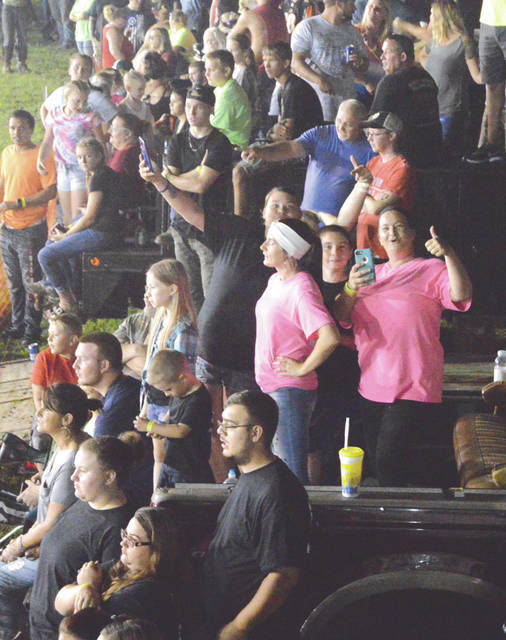 Fans packed the infield and most of the main grandstand, July 30 during the Smash It Demolition Derby at the Greene County Fair. 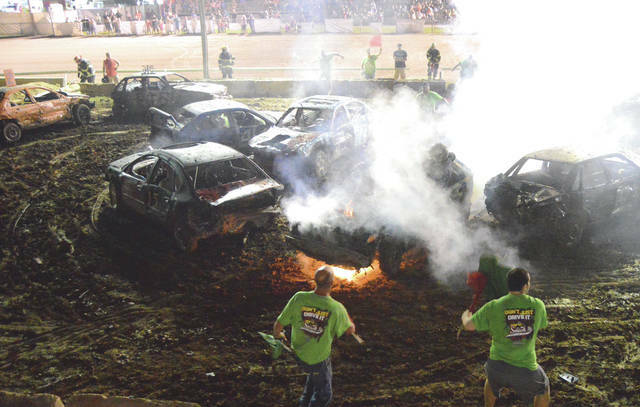 XENIA — Whether the car count was 25 or two, nearly every Smash It Demolition Derby event had an exciting conclusion July 30 on the muddied front stretch of the Greene County Fair’s Chip Noble Memorial Track. The fair grandstand was nearly packed full of fans, and a few hundred more fans lined the infield, as eight events were contested on the night. The youngsters started things off with a Power Wheels derby among 17 competitors, with each helmeted driver receiving a well-earned participation trophy for their efforts. Smash It officials dropped a concrete barrier in the middle of the marked off battle area on the Chip Noble straightaway, and contested the eight-man Modified Mower event on one side of the barrier, and the nine-man Street Mower class, at the same time. The street mower class ended quickly, but the modified event turned into a lengthy battering ram duel between Wilmington’s Jacob Bryan and Logan driver Nick Hampshire, with Bryan eventually being awarded the win by technical knockout. In the four-car Smash It Kicker event, Lima’s Brady Allen stopped Shane Sprinkle of Springfield for the win. Just two cars showed up for the Any Year Wire Division, where the driver’s side door is welded shut but the other doors are wired, chained or banded shut, but Bryce Nichols of Urbana and Scott Ziz of Celina put on quite a show. Nichols’ tank of a station wagon had Ziz’s full-size Chevy sedan partly over one of the concrete barriers at one point, but Ziz rallied to nab the win after pinning and immobilizing Nichols’ station wagon in a corner. The seven-car Smash It Mini Stock event had a similar ending as Hamilton’s Jimmie Rutherford smashed his brother Jordan Rutherford into a corner for the win. Could some brotherly love have occurred as well? Jimmie appeared poised to bash in the passenger side door of Jordan’s trapped-in-a-corner, too-damaged-to-recognize machine, but swerved to the left at the last second and caved in his right-rear wheel instead. A whopping 25 cars competed in the Street Stock Mini event. With fans screaming “Pi-zza Hut! Pi-zza Hut!” with his every collision, Xenia’s Matthew Reed won the eight-minute event with a final head-on collision levied against fellow Xenian Tony Jenkins. Jenkins’ wheels would barely move, despite Tony pushing the gas pedal to what was left of the floorboard. The transmission apparently had had enough and soon caught fire, ending the event. Smash It officials red-flagged the event to a stop, and members of the New Jasper Township Fire Department jumped over the barricades to assist Jenkins, who climbed safely out of the burning wreckage on his own. In fitting fashion, yet another Greene County winner emerged, this time from the night’s final event for full-size street sedans. It took 22 minutes, but George Stevens weaved and walloped his dark-blue A&L Sanitation-sponsored machine to the win over 11 other competitors with a final smash of the green Triple-D machine of Wilmington’s Billy Braun. Despite several red-flag stoppages and one upended lawn mower driver requiring brief medical attention, there were no permanent injuries to any of the drivers. A crew member for the upended lawn mower pilot had said his driver was okay as well. The same cannot be said for most of the machines themselves, however.